As a maintenance manager, you want to give your team every opportunity to succeed in the workplace. While you may not have complete control over their performance, something as simple as a poorly maintaned HVAC system can have noticable effects on team morale and performance. Here are a few common issues that may cause problems in the workplace. Inconsistent airflow is an issue you can usually identify. 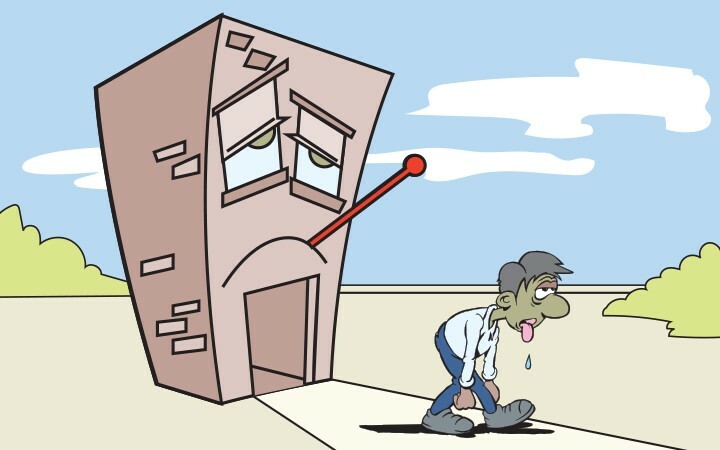 If there are drastic temperatures changed in parts of the building this is a symptom of poor airflow. This is usually caused by cracks in the duct work which will make certain areas warmer (or cooler) than others. In some cases, this cracked duct work can leak fiberglass into the air, which can cause respiratory issues. Fiberglass can also get into the electrical elements of your system and can lead to a system failure. HVAC systems function best when they are tuned to the size and needs of your particular work environment. You have to have the correct size system for the building and the unit has to be able to distribute and regulate airflow effectively. Too high and you get windy conditions; too low and there is not enough air to keep the room from becoming uncomfortable. IAQ stands for indoor air quality HVAC system is responsible for managing the quality of the air in your building. as mentinoed above, fiberglass leaking can lower IAQ as well as standing water, overheated components, or something as simple as a dirty air filter. It is imperative to perform regular on your HVAC system to ensure that none of these issues happen. Change the air filters when needed and always do a system check with a licensed professional and have the unit checked regularly as part of your preventative maintenance program.